Quick review of two completely contrasting shows I went to today in Glasgow, which had strangely unifying themes running through them. First up was the latest piece of theatre from the National Theatre of Scotland, The Day I Swapped My Dad For Two Goldfish at Tron Theatre, Glasgow this week . It is based upon the children's picturebook written by Neil Gaiman (Sandman, American Gods, Doctor Who scripts, whatever) and artist and illustrator Dave McKean. NTS have already collaborated on a successful stage adaptation of another Neil Gaiman children's book, The Wolves In The Walls which got rave reviews when it was out. However this book, which I've read about a hundred times with my kids in the library, is a shorter, simpler affair and it was harder to picture how it could be transferred to the stage. 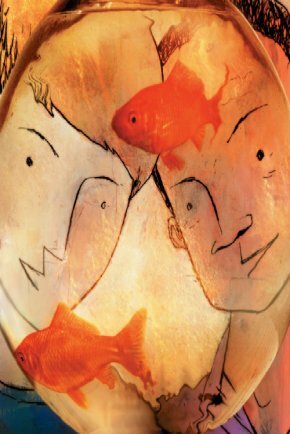 In it Tom wants his best friend's goldfish so much that he swaps his dad for them. His mum, understandably, doesn't like this idea much so she sends him back out to retrieve his dad. As mum gives them a row a kid in the audience with a great future ahead of him as a heckler piped up "He should have swapped his mum". It was all very cleverly done. We start off in a wee studio space upstairs at the theatre and are lead through corridors, dressing rooms and backstage areas as we track down dad, who has been traded on for an electric guitar, a gorilla mask, etc. The staging was imaginative and worked well with the story and the sets aping the book illustrations were strikingly done. The actors playing the bickering siblings did it with energy and riffed well with the kids in the audience following them on their adventure. It appealed most to my 6 year old, who glowingly praised it as "even better than I was expecting". It has already been shown in various venues around Scotland before landing at the Tron this week but worth catching if it comes to a town near you. In the foyer afterwards they held a brief "swap shop" with toys, books and games which took a bit of explaining to my pair but they were happy to get a fluffy Tigger for a wooden caterpillar. By contrast later that day (and clashing horribly with the Champions League Final) we had Suggs on at the Pavilion Theatre. He did this one man show at the Edinburgh Festival last year and has been touring it on and off ever since. As a youth, ska was the music that pressed all the right buttons for me. People like me who can't dance can dance perfectly well to it and with Jerry Dammers's political ethos driving the Two Tone label it was music with a message too. I was just too young to see these bands live in their prime but have followed all the Two Tone artists in their various solo guises and re-unions ever since umpteen times. Madness never seemed to be in it for the politics (could you imagine The Specials playing at the Queen's jubilee party?). They just seemed to like playing the music and looked like they were having fun. They did sing in their own accents about day to day, mundane events, which was not the normal way of doing things at the time. In some ways it has taken Scottish acts another 20 years to do this and stop trying for some mid-Atlantic drawl. This was something he acknowledged in the show which he had taken from Ian Dury's singing and he illustrated it by singing seamlessly from "What a Waste" into "Baggy Trousers". Although my brother has seen Madness perform live a few times, including at their earthquake inducing "Madstock" gig, the one time that I saw them put me off doing it again. In 1992 I saw them at Ingleston supported by The Farm and 808 State. After the first act a minor riot broke out in the crowd which ran about like a flock of starlings meaning that every so often, even when standing still you kept ending up with the brawling skinheads tumbling past you. Apparently it was due to a dispute by rival security firms, but the result was the hall lights being kept on for the main act, a quick blast through their set and no encore. There were no punches thrown tonight as the audience chuckled away at all the right places. 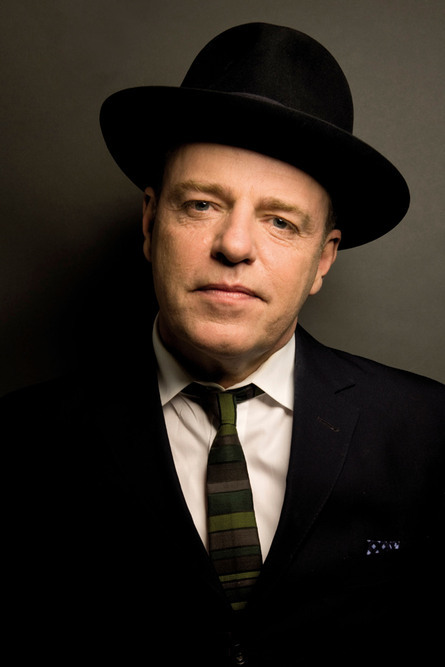 After deciding at the age of 50 to try to find out a bit about the father he never knew, Suggs used this as a springboard to wax nostalgic about his life and music. It was peppered with a few short songs and interesting wee anecdotes. The tightly scripted and directed performance though didn't leave much space for spontaneity or any audience interaction. Before we got there my brother had hoped that we'd be spared a rendition of "Cecelia". But it had to be sung to allow the story of Chris Eubank guest presenting TOTP introducing "Suggs singing Cecelia" to be told. The theatre packed with middle aged men wearing Fred Perry checked shirts over their bulging waistlines would have been happy if he'd come on and played the spoons for two hours, but he gave us more than that. Two shows for two different crowds but with the same message. Both following people seeking their lost father for a bit of pathos and both finding that adventures in life are best if you've got a family or sister or band of friends to share the fun with. We're chuffed that you and your family enjoyed The Day I Swapped My Dad for Two Goldfish. "Even better than I was expecting," is a great review to have! It's interesting to see how both your excursions that day had an unexpected shared message.